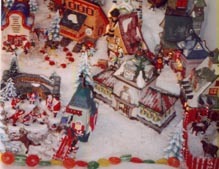 The North Pole Village was the second village that I started collecting. My daughter likes it so I started it and now I have every single piece that goes along with the village!! 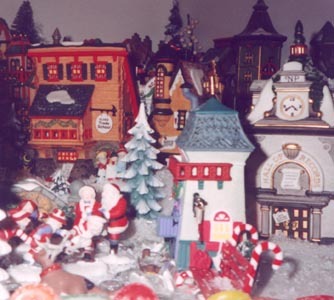 Here's a picture of what part of my village looked like this past Christmas. Here is the rest of the village...what couldn't be seen in the other picture. Here is a picture of Santa's Workshop, in the back. This is the favorite piece of my daughter's...so far that is. The Elves and Mr. and Mrs. Claus play on the ice.